I am a big fan of anything Rum related. As spirits go it’s a great all rounder for cooking, deserts, mixers, straight up glugging and using the casks to finish single malts. 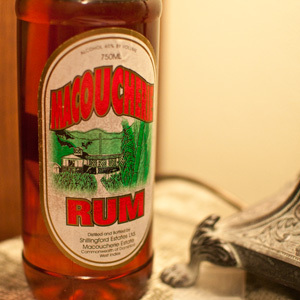 The taste for rum soon became known amongst the family and my super awesome mother-in-law recently acquired a bottle of the Macoucherie pure sugarcane Rum for me to try. This Rum is from the Shillingford Estate out near Salisbury on the west coast of Dominica. The method hasn’t changed since pre-war. The fact it comes in a plastic bottle, it was aged in a burnt cask barrel and Red Rum spells out “Murder” backwards I started to think hard about whether I should be drinking this or using it to degrease engines. What does Macoucherie Red Rum smell like? You are never quite prepared, there is an overwhelming smell of sugarcane and Alcohol. Almost sickly. However, if you take a few more long and hard sniffs it is really quite pleasant. The initial “holy crap” fades allowing the smell to alternate between the sweet sugarcane and burnt wood. What does Macoucherie Red Rum taste like? A hell of a lot better than it smells. It is incredibly sweet but there are distinct hints of spice and wood. The sugarcane flavour comes in waves. It is a mad drink but somewhat surprising. I like it. In fact it is awesome. The plastic bottle, the initial holy crap smell, the flavours, the way it was made. Everything about the drink makes it a great conversation piece, a true novelty item to both own and enjoy with friends. I can see why they produce so much of this stuff. I was looking at the bottle of Sam Song rum from Thailand I have in the kitchen, it looks old and dangerous. I’ll have to try it soon, I’m just scared! hi james my name is peter. im trying to tack down a bottle of Macoucherie Red Rum within the uk. my partner is a direct relative of Shillingford family as is unable to find it within the uk to give it to her. could you please let me know if you know any good websites where i can order it from or places with the uk, i would be very thankful for your help. The above appear to be the distillers who you may be able to contact to have some imported or something. Let us know how you get on. I don’t think I am able to help. The bottle I reviewed was obtained direct from the Shillingford Estate while on holiday out there.